Start the video at 44:51 minutes to see the show. 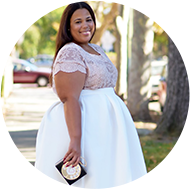 I will say that it takes a lot to impress me in plus size fashion, but I must say that Isabel Toledo Collection for Lane Bryant has got me impressed. I visited the store a couple of days ago and the first round of releases weren't for me and I was sad, but then I saw the runway show. The runway show included items from the current release, but it also has items from a launch that will happen this Summer. Per the LB tweeter, they will release the items towards the end of May. From the runway show, I am all about those summer items. They were flow-y, romantic, and the items had length...like below the knee length. Now that is really hard to come by in plus size fashion. Personally, I love the mustard and flower printed skirt. There was also three dresses I liked, 2 black simple mid-calf length dresses and the floral strapless dress. There were at least 5 items that I could see myself purchasing easily. I'm really hoping that all the items make it from the runway exactly how they are. NO CHANGES!! If this is the direction that Lane Bryant is headed well then I'm happily ready and waiting. You can see the runway show above. Style Notes: I know a lot of you cited sizing issues. It did run small, but with being a more tailored look with most items not having stretch it caused you to size up more than you normally would. I am a lot more hopeful on the summer items because there were a lot of fit and flare items. These are, generally, an easier fit than a lot of the straight dress style currently available. You can check the first round of releases from the Isabel Toledo Collection for Lane Bryant here. Thanks for posting the entire show. This collection is by far one of the best I've seen in LB for a long time. So many things a woman of my age (55) can wear. The orange dress, gold skirt, brown long ensemble (I feel for the falling model), and so many covetable coats! Garnerstyle....you rock! Thank you...I really think these transcend through different age groups, which is an awesome thing! I too attended the show and was impressed of the tailoring and respect for styles and creativity that went into these pieces. Can't wait to see what pieces will be going into the stores. Well it's about time they had a real designer collection. This looks great. Didn't think I was going to like after seeing the collection in stores but I counted about 10 items I must have. Can totally see you rockin some of this collection. I was hoping that Linda Heasley would make some major changes at LB and with this collab she definitely has. Now I am just hoping that the women who are always complaining about options will appreciate what they are bringin and not get crazy at the price points and support it. Impressive. I'd say I liked 85% of the items on the runway. Love the collection. But some of these models are killing me. Its all good though, they have more balls than I do! LOL! Thanks for posting this, Chastity. And I think you're right: this isn't aimed at the regular LB customer so much as it is toward the "fallen" customers. I really appreciated the pattern mixing, the really gorgeous plus sized models, and I kind of loved that they were all styled a bit like Isabel herself! Really, really loved a lot of those coats! Some of the models can't WALK! Didn't have time to watch the whole video, but I liked some of the flowy black-and-white pieces a lot -- none of which are in the current round of releases. Looking forward to seeing them in stores! The struggle was real! LOL but to their defense you gotta think plus size agency models aren't getting the runway time that their counterparts are. Those girls mostly do print work. I watched the whole and thought the same thing...I actually wondered if they'd been coached to NOT do the runway strut (to eliminate some of the "bounce" factor that we big girls can have) but I think most of the problems with the walk were due to the clunky platform shoes at the beginning of the show. After the outfit change when everybody was in heels, there was a big difference in how well they walked.